You've been raided, and your day is ruined. There is no glory in This War of Mine, things just get worse. Most war games only ask players to defeat an assigned enemy. First-person-shooters especially are guilty of this, the desire for adrenaline outweighing a realistic depiction of war. This type of game asks the player to lead their forces to triumph over a clearly defined antagonist(s), with violence depicted as a path to glory. 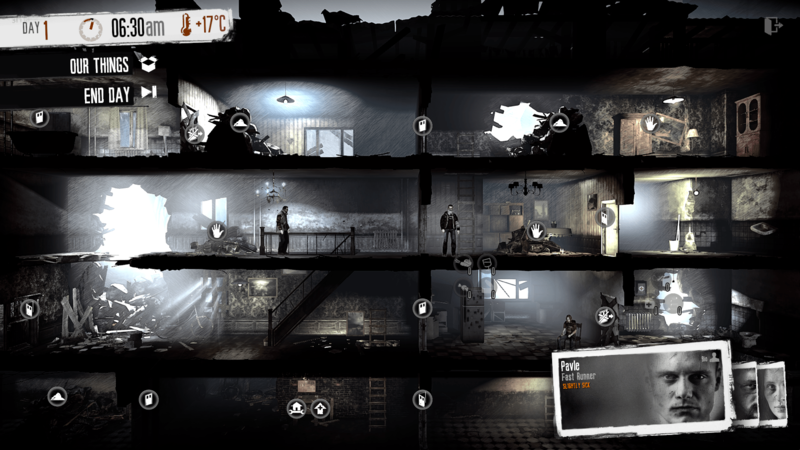 Poland’s 11bit Studio reverses these conventions with This War of Mine. Using a simple point and click interface, you control a randomized group of survivors, each with unique personalities and skills, as they try to survive an ongoing war in their city. The game doesn’t clearly show if either side of the conflict, army or rebels, are in the right. Truthfully, it doesn’t matter. You’re threatened by both sides, and will likely rob or attack both in order to survive. Every decision has consequences, and the number of decisions available is constantly changing. It’s usually shrinking. TWoM reminds me a little of Papers Please. 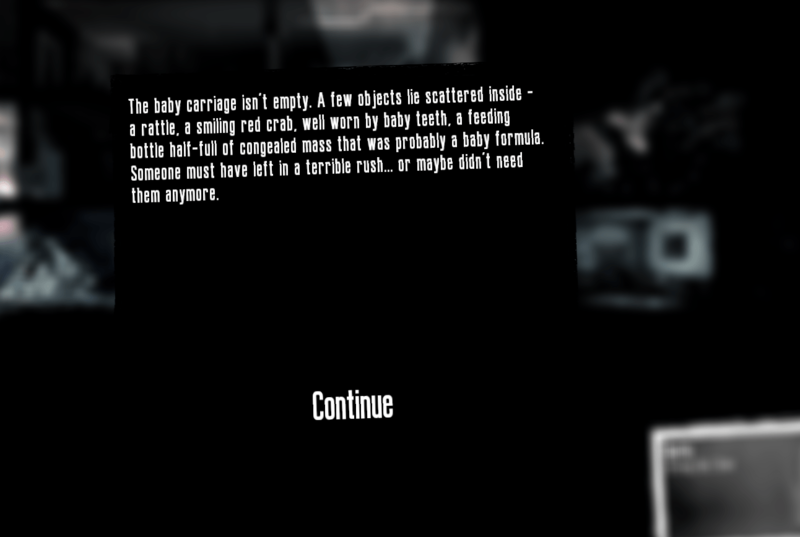 Both games examine a war (in both cases a civil war) through the eyes of the civilians. Both games resolve around preserving a family unit in a brutal world. Both systems center on the principle of decisions having both practical and moral factors, and the inability to always satisfy the two (if either). Both games also take place in imaginary, Eastern European satellite states not far removed from the real deal. This could be set in Poland or Ukraine, anywhere in the Baltic region really, and felt just as authentic. 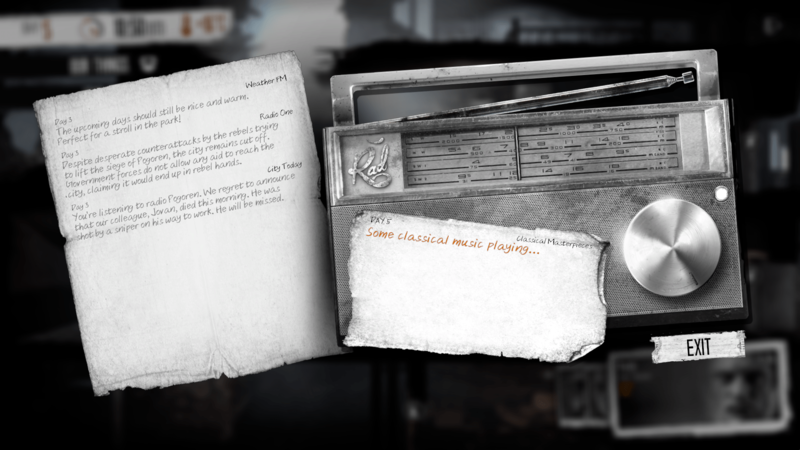 The minimalistic ambient soundscapes and bleak graphic-novel add to the game’s haunting feel. Where most war games ask you to win, this game asks you merely to survive. Instead of ambiguously motivated hero soldiers, you control a group of civilians who’ve banded together to survive the civil war destroying their city. Accomplishing the essential, day-to-day demands of survival such as gathering food and heat are your worries, not destroying the enemy. The hovel you use to hide from army snipers during the day has debris that needs clearing, shell-holes that need patching to keep out thieves, and rat traps to be set if you want meat. This game is about managing your life in order to preserve it. Character backstories are extensive, and revealed over the course of weeks. Even though violence is inevitable in this world, it is rarely (if ever) in your best interests to start combat when encountering NPCs. Violence will find you. It doesn’t need your help. Your rag-tag team of survivors, and the broke-down palace you live in, will be always under the threat of violent scavengers, military forces, and the opportunistic criminal element. When violence does occur, the effects are immediate and devastating. Characters are realistically fragile. Injuries or illnesses require extensive treatment and rest before a character can operate at peak efficiency. Since sleep, hunger, and morale also factor into your characters abilities, a lack of food or a bad vibe in your shelter can further hamper your ability to recover from a violent encounter. Depression can lead to characters killing themselves, running off with supplies, or simply breaking down to a catatonic state. An unnecessary risk gets your scavenger killed on a run, and your house falls into depression. Already starving (they were expecting supplies from the scavenger, they become laconic. That night, the most sensitive person in your house breaks and runs away with your medical supplies. You’re down to half your population, and those who stay are too broken to fix things. Mistakes like these have a nasty way of compounding over the course of the game. Another bit of depressing tangent storytelling. Time is a key factor, with the days being split into halves: the day portion consists of shelter construction, team management, and special events. 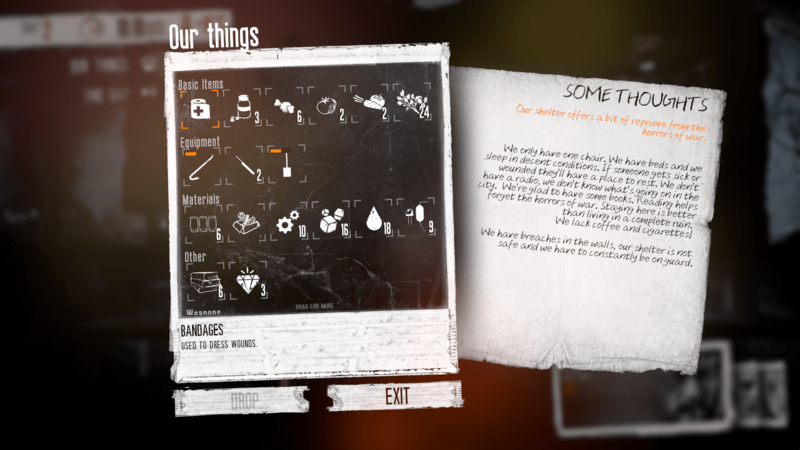 The night portion is spent scavenging locations around the city and balancing the guard shift at your home base. More challenging is the idea the game only moves forward in time. There is no save function, aside from the auto-save that occurs between days. A great move by the developers, removing the safety net adds permanence to every decision you make. A mistake made in the game is one that you’ll either have to live with, or restart to avoid. As someone who easily gets attached to his characters, having somebody gunned down on a scavenging run almost always means hitting the reset button. Planning on restarts is unreliable however, as several elements of the game are randomly generated. Your beginning characters, supplies, and time of year come in various combinations with other combinations opening as you play. Different characters can arrive at the house throughout the game as special events, if you’re lucky. Each character’s unique, specialist skill set means you’re adjusting your gameplay and survival mentality each time. Some characters, such as child runaway Arica, turn easily to thieving (normally a disaster for morale). Others are better suited to growing your at-home economy, such as builder Marin or chef Bruno. Characters like ex-rebel Roman are already primed by their history to violence, but this doesn’t mean that their violent acts won’t have a negative effect on the rest of the team. Every combination of skills and personalities creates a unique gaming experience, and contributes to the game’s allure. Location elements are also randomized. You may grow familiar with the layout of locations over time, but the materials available to scavenge change, as do location specific events. The game is constantly trying to force you into uncomfortable moral situations, where you’re choosing between what’s best for you and what we’d commonly consider a morally sound decision. The conflict is all internal, as the game repeatedly sets morality and practicality at odds against each other. For example: A supermarket location might be occupied by other scavengers, forcing you to race through the market to scavenge ahead of them before the essential items (usually food and medicine, or stove fuel in winter months) vanish. Or, in the darker storyline available, the location might be occupied by a single soldier forcing himself on a female scavenger. This second option obviously creates some more complicated decisions for the player. Intervening, either by attacking, or creating a distraction, creates a pretty good opportunity to get shot in the back. But leaving the scavenger to her fate means the entire house will be depressed about the brutal incident for days, if not weeks. On top of which, you’ll likely feel a deep sense of shame and discomfort in the knowledge you’ve allowed something like this to happen, even in a virtual reality. It’s disquieting. And worse yet you can find yourself forced into making immoral decisions, such as necessary medicine from nearby elderly survivors, and have it all be in vain anyway. Maybe the medicine doesn’t take, and your teammate goes down anyway. Winning is not guaranteed by any stretch of the imagination. The Roguelike mechanics system can also make render a game unwinnable. Perhaps the winter snows come just as you’re about to hit up that warehouse for medical supplies. Suddenly you can’t reach the warehouse, and you sit at home while your group builder succumbs to a normally treatable malady. Then again, this is what one would expect if the game’s horrifying situation was a reality. Of course not everybody gets to win a war, especially when you define winning the war as simply as surviving. What you have, and what you’re thinking. Information about the outside world is also a commodity. Less than 11% of players actually make it to the end of this war. The furthest I’ve progressed in-game is 33 days. Around day 15, the word on the radio was that troops were coming to liberate the city within 10 days. Ten days later, the radio said things had changed at the front and troops wouldn’t arrive before winter. By the time my scavenger was killing stealing street-gang medical supplies for a fellow survivor, no answer was apparent or forthcoming. I know the game has endings specific to each character, endings that vary based on your actions during the war. But knowing this doesn’t clarify the end point and the longer you play, the more of your time goes to wondering just how long a war this destructive can actually last. Can we actually win this game? Or are we just putting off losing as long as possible, desperately hoping that things will turn out for the best? I don’t know, but that pendulum swinging between hope and despair is kind of the point. But there’s just enough hope here to keep me coming back to the game after each heartbreaking failure or indecency. 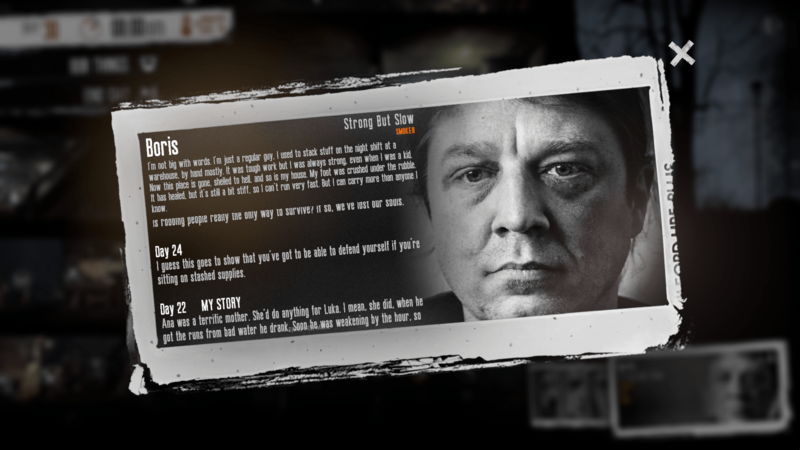 This War of Mine reflects on the brutality of war for civilians, but just as well represented is the milk of human kindness. The possibility that things could turn out to be better than they are is what keeps me coming back to the same bleak vista. 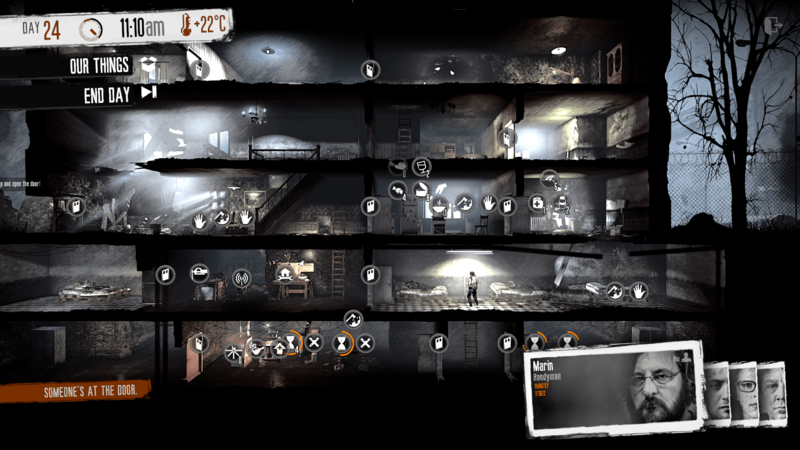 Have any great game tips or thoughts on This War of Mine? Leave a comment!